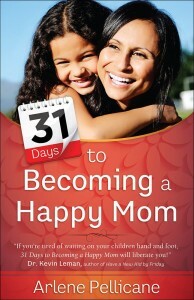 Today we are featuring a giveaway of 31 Days to Becoming a Happy Mom. Leave a comment below to enter. That daunting time of day when you’re scrambling to put something together for dinner, urging your children to finish up their tasks because right after dinner you have to leave to get to church, or practice, or piano lessons, or wherever it is you are taxiing your family next. That would be my 31 Days to Becoming a Happy Mom book. And do you know that moment was an AHA moment for me? I realized that whether I had a stressed out demeanor or a happy, calm demeanor, I would still have the exact same activities in front of me. Make dinner. Have the kids play the piano. Get to church on time. Why not experience all these tasks with a smile on my face instead of a frown? Why not take a deep breath and change my attitude? We’re giving away a copy of 31 Days to Becoming a Happy Mom! Just leave a comment below about the stress level in your household (high, medium, or low) and you’ll be entered to win 31 Days to Becoming a Happy Mom. This email couldn’t have come at a better time. It has been TOUGH lately, parenting our three little ones (8, 2 & 1). They’ve all got super strong personalities and mouths to boot. It’s a major struggle to make it through the day and be able to greet my husband with a smile when he gets home, because I’m straight up WORN OUT and exhausted. Stress level? Uber high! With your young kids, you are all hands on deck! Hang in there, find little reasons to smile, and big blessings to your family! Let’s get you from uber high to tall building high! You are not a failure…remember, failure is an event and not a person. It sounds like you are a terrific mom who cares for her children and who is counting on God. Sounds pretty great to me! My mom stress level is pretty much at medium. When I plan and let God guide, life is so much better! I really needed this today. I hate to say it, but my stress level is pretty high. I have 3 wonderful kids, but I am struggling so much. My kids are 11, 9 and 7. With pushing the boundaries and hormones and general bickering I am at my wits end. I pray for peace and a better attitude but I can never seem to grasp it. I also deal with anxiety and depression on top of it all. I need God so badly. I feel like a failure when I lose my temper and yell. I want to be better, do better. You have a lot going on. As Paul wrote again and again, Grace and Peace to you. Such a great reminder today! My stress level has been off the charts all summer and with school starting in a week – I homeschool my 8 and 4 year old boys and have a 6 month old adopted daughter – I am in need of some serious peace and normalcy!! WOW! That’s a lot of life! I have 4 kids and its such a challenge to be working and coming home to make supper and rushing to extra classes and then to church, and then while you preparing supper, you helping out with homework at the same time, so we try to do as much as we can, and at the same time in all this rushing I really loose myself because you try to contrite on everything at the same time. High, high, high! I need mommy happiness to keep me focused. Not doing it well on my own right now for sure! My stress level is medium-high, depending on the day and sadly often dependant on my kids’ attitudes/behaviours. 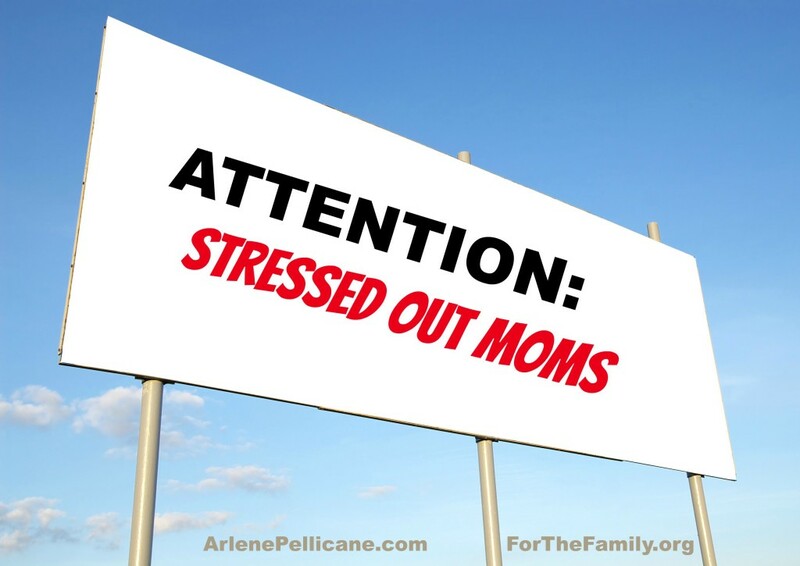 I have 4 children, homeschool and the stress level can be high at times. I feel like I’m just not good at this job but I want to be great & love it! I feel as though my mom-stress level is pretty high right now during this season. This book sounds great, and I’d love to win a copy! Stress level is medium to high most of the time because I always feel like I am behind. Challenging stage of life right now and struggling to find joy in the midst of chaos. High. I feel like I tread water. 🙁 I could use some inspiration. It’s hard to remember you are in God’s hands some days and having these reminders help. I’m a working single mom, so my stress is always at top level. No matter what, I feel like I can never catch up: get household up & where they should be, work 8-5, then go home & “work”… people don’t understand “me time” is after everything else. We have some low stress days but we are between ministries and our family is separated for a time and that is very stressful. I know I am not as joyful as I should be. Hi, sounds like the book for me:-) I’d say our stress level is about a medium unless I make it high…Honestly believe it could be low stress it just depends on how I handle life… So I’d love to win this book, might have to get it even if I don’t 🙂 Thanks for you work for families! I’d say our stress level is med-high. Have an 8 month old, am pregnant again(! ), hubby has a new job, we just moved, financial burdens… I would so love to read this book! 🙂 but just the little blog post today is an encouragement to me to smile and keep trusting God! Life happens! For us, it looks like this: Two working parents, an almost 10 y/o who’s starting at a new school in the next week, leading a large class (over 200+) at our church, soccer, friendships, Bible studies, and more! We ask our son for “attitude + effort”…but often aren’t willing to give it ourselves. The Lord has really been convicting me of this and has helped me slowly start to turn that around! My stress level is 100 on a 1-10 scale! My family of 7, cat, dog, and 2 new heit crabs are renovating our soon to be new home while living and at my husbands office apartment and sending first born to college this weekend ? Between a baby who doesn’t like to sleep, starting our homeschool lesson, and me recovering from Gallbladder surgery… The stress level is High. HIGH! I just think I can take care of everything. I always stress myself to the max trying to do while I’m suffering inside. High stress level in our home which I’m trying desperately to change. I long for a calmer, more peaceful home and to be able to let the little things go. My stress level is at a medium-high. This will be our first year homeschooling and my husband recently started a job that has him out on the road for 3 to 6 weeks at a time. Ironically an advertisement for ‘thermo spas’ is popping up while I read this article… I could use this book and maybe I will read it in a thermo spa hot tub 🙂 I can dream right?! Thank you for your timely information. High!! We have had so many changes in our life including a major move with everything new! And With four kids not being the happiest about the move… being away from grandma…and now with one starting high school and one starting preschool! I have had plenty of those nights filled with guilt and tears from yet another day of being that mom that I never wanted to become! Where did that fun and relaxed mom go??? I would say the stress level in my home is definitely high. I would LOVE. Any help trying to keeping my anxiety level and stress under control. Super high. We are a military family in the midst of a cross-country move with a 3 year old and a 9 month old. Tension is definitely running high right now. I’d say my Mom stress level is all of the above (low, medium and high), depending on the day of the week and how much we have going on! This article popped up just as I started to feel extremely overwhelmed. As a mom to five young children I’ve been overly stressed and running on fumes. Stress level is high most of the time. As a mom of 3 (ages 8, 6, and 1) and a new step-mom to 3 more (ages 19, 13, and 12), I find myself often losing my cool and becoming very unhappy… I would love a book like this to have my “mom time” with to help refocus. Low. Having 8 children ranging in ages from 1 – 19 has given me the opportunity to realize that time goes by so quickly. It seems as if my 19 year old was in my 1 year old’s place just yesterday. I try to remember to cherish every moment, be thankful in all things, and have a joyful heart even in the midst of the chaos, trials, and struggles along the way. We can always find at least one thing in the middle of a stressful situation, tense moment, or other type of fretful time to thank God for …. even if it is to thank Him for being Who He is. That is a great stress relief! HIGH! Behavior issues, dietary restrictions, health issues, isolation, no support system, husband home only a couple hours each day, on top of laundry, housework, yardwork, gardening, food preservation, flat tires, etc. Praying to a calmer Momma. This will be a good study. VERY HIGH! My husband owns his own custom farming business and he also has a pig barn that requires a lot of work. I am a stay-at-home mom but I also run both a Photography business and an Etsy shop. We are expecting our second baby in just over a month and I feel like I cannot possibly be a good mom, wife and business owner as well as keeping a clean house all at once! I am just so constantly overwhelmed. My stress level is HIGH. I am home with our four little ones ages 8,4,2, and 1 and work partime on the weekends and some evenings. Trying to keep up with the constant messes, the attitudes, the bickering and screaming, and daily demands of having young children has gotten me so worn down. I have been trying to adjust my attitude, but I am struggling to find my joy in the chaos. HIGH! I work at our 7 year old’s school, have a very much 2 year old girl, three dogs (one is a police dog) and my husband is a police officer. I balance our family, cleaning, food preparation, finances, potty training, weight loss, car troubles and everything else that makes up our home. I am desperately trying to seek God for help and joy in all I do. Maybe this is my answer! I actually thought I was reading about my life….coming home to figure out dinner, my daughter who is 9 has piano practice on Wednesdays, Cheer on Monday and Wednesday as well, I am a Sunday School teacher so I am involved with our church. Having 3 kids (18, 14, 9), I feel like I run all over. My oldest has epilepsy so we are running to and from appts often, my middle child is active in sports as well as my daughter. My husband has his own business so I play secretary to that as well….so I work my full time job to come home to my 2nd full time job, dinner, laundry, bills, yardwork, business paperwork, help with homework, chauffer for the kids, doctors appts, practices, house projects, church events, fundraisers,,,,etc. Please one kid, please another, At times, I don’t know which way to turn and seek peace in a bath with hopefully no disturbances…with my kids at the age of having more independence that should be easy…NO! I often don’t know what that is and life can be hectic and stressful. You can’t always find your happy place when at the beck and call of others all the time. Although, I would not have it any other way….I would love to win a copy of your book…maybe it can show me that I don’t have to be the perfect mom (as I have it in my mind) but a happier mom and a better mom for my kids. HIGH!!! Working full time outside of the home, a side job to try to bring in extra money, a 4 year old stroke survivor with cerebral palsy, a 2 year old, and tons of home repairs that cannot be afforded!! Seems like house work barely gets touched, missing a lot of work due to tons of specialist appointments, and struggling to keep myself together because I strongly feel the need to be at home instead of in an office. HIGH! I am living with a chronic pain syndrome and am a stay at home mom. Some days I don’t know how to cope and I can use all the tips I can get to help change the atmosphere of my home. I hate to say it but I’m under a high level of stress here. My 4 kids are ages 5,4,2,10m and sometimes it gets overwhelming, it will be a great blessing to win a copy of this book. I just had baby #5 seven weeks ago. I feel like I have been at a high stress level since finding out we were pregnant (we lost our daughter at 39 weeks right before delivering so I have very anxiety filled pregnancies ever since). I thought things would get better once baby was born but his failure at breastfeeding made me a huge ball of stress: pumping every 2 hours, trying to nurse, bottle feeding all while having to take care of the needs of my 4 other little ones. The house is a disaster which adds to my stress level. I have spent so many days crying and praying that things will let up. Baby is finally figuring out the nursing after 7 weeks of trying, so I feel like I can breathe again now that I don’t have to pump. I would love to find a resource to get me centered and help me get back to a more peaceful mommy. This came at a perfect time as I was back to school shopping today with my 3 kids and they were “a lot to handle” today! Thank you, I hope I win! My stress level is extremely HIGH! To the point it’s made me sick and I’m starting to really not like myself and becoming a recluse. Fairly high, lots of bickering among the kids has me not in my best mood….which causes lots of bickering among the kids! ? I would say we have a bit of medium stress at our house. Some days it goes up to high. I would love to be able to be more calm about all the work that needs to be done. With 4 kids one a toddler and 2 Special Needs plus another one on the way in 3 months it feels like every morning I wake up already stressed about how to handle the day. Along with all of this I’m attending school full time because my husband isn’t doing very well and we want to make sure that I have a job that can provide for when he can no longer work due to his 2 immune diseases. It’s a hard thing to get up and even Hardee ro keep going. I end up just counting down the hours to the kids’ bed time so I can go lay in bed and take in the silence alone before my husband comes to bed. Medium to high. I would like to change it by changing my attitude toward stress! High… I’m the one making it that way… I long for joy and peace in my heart, after all, I’m doing what my heart longed for! So why am I so miserable?! Med- high. My husband stresses us all out, then we are impatient and short with each other. HIGH!!! I love my children dearly, but don’t always “like” them and think that I’m maybe taking life too serious and should ease up abit and enjoy them more ? High level. I have a 13 and 16 year old, I homeschool , they are in 8th grade and a senior in high school, working on his associate degree at community college. Our current stress level in our home is the highest I think its ever been! I’m returning to school after taking a year and a half off so I can finish my senior year and get my bachelors degree done and pursue a masters. My husband just came home 3 months ago after being gone for a year while I was home with our 2 year old by myself, in a new town, with no support near us. Now he has to leave again for a couple of months and with both of us also in school, its just very overwhelming and stressful. I feel like I haven’t smiled in weeks and have a hard time being patient with my husband and small child because I’m incredibly burnt out and stressed to the max. Its hard making friends because of how our life is. Its very difficult. I’m trying to do my best everyday to lean on Him and stand strong in my faith. We definitely feel the strain emotionally of being stretched thin though! The level is very high in my home at the current moment. Between battling my kids adhd, my ex trying for full custody, teaching my 6 yr old to read, my finances going down the drain. I love my kids. I have 5 ages 12, 9, 6, 3 (my only girl), and 10 months. I pray all the time that God give me knowledge. I feel so guilty for losing my temper. High stress! Really apprehensive about starting back to homeschool. Baby number four due in three months. I am mopey lately, feel unsupportive, and can’t seem to muster up joy to spread to my family. It’s high!!! Two kids, 6 and 4. I work from home (mostly at night time) and just feel as though I’m “on” and needed 24/7-not just from my family. Looking forward to bringing down the stress level ASAP! Stress is med-high. We had a pipe burst, and they are still fixing our home. Meanwhile, I am at home this summer with two kids with contractors and construction noise every weekday from 9-5. Ugghh! So would like to have this book! Moved across the country last year for hubs job only to fight employer in wrongful termination (he was fired while we were on vacation, yep they called him and told him half way into vacaation) 15 months later. Now we are scrambling to move back home with two elementary kids in tow before school year starts. Living off cashed out retirement first move wiped savings . May need parents (in their sixties) to co-sign an apartment for us. Home is in process of being prepped for sale. Kinda stressed! p.s., I would love to win/read your book!!! It’s high…very high. We are raising our son who we adopted as a newborn after ten dark and silent years of infertility. Sadly my precious boy was exposed to drugs and alcohol prenataly. His bio mother did methamphetamine daily as well as heroin and alcohol. He has extreme rage, dysregulation, destructiveness, aggression and constant upset. He is also loving and sweet. He’s almost three now and the joy of our lives. But the stress is high and I gained 100 lbs in his first two years. I have nothing left to give after taking care of him all day. I would love to find my smile again. Thank you so much. Stress overload.. Single Momma, homeowner of a house that needs constant TLC, small town hard to find compatible daycare, little to no help coparenting at best, sprinted child with possible as I was recently told, to top it off I grew up with an agressive controlling step-father who yelled…continually torn & second guessing my every move as I lost my Momma at age 20… Little to no family to help… 5 1/2 years in with little to no reprieve…whew that the long story short…on a positive note I wouldn’t trade my girl for the world! ? My level is pretty high right now. My social needs adult daughter just moved back in, after being away for two years. I have two teen boys about to start school tomorrow. On top of all that, I have a VERY high strung nine year old, who will be home from school another week, and a teething toddler! I need this.. Two girls, 14 months, 2 days apart.. God’s plan, not ours.. But I am exhausted & stressed to the max! Stress level is very high in my house. I just saw this contest 5 minutes after yelling at my boys to go to sleep. Feeling terrible. My hubby travels a lot and it leaves to do most of the stuff with the kids alone. Help!!!! This email came at the perfect time…this week my daughter goes for her Echocardiogram (she had open heart surgery at 2 months old amongst many other surgeries) so my level of stress, especially this week, is very high! Dealing with a medically complex 3 year old girl and a 5 year old son (starting kindergarten this year – ugh!) has me on edge almost every day. I try my best to let go and let God but it’s not always easy. I would love to read something to help me on an everyday basis! I don’t want to say high because I’m sure other moms out there are struggling with more. So with a 6, 5, and 2 year old I had to have four major brain surgeries in past two years for my disease which is incurable. My husband’s a soldier getting out of the military and I’m now back to work full time so we can afford to keep our home. I’m tired. So tired. I look at my children and I love them. We buried our daughter in Texas so the ache of the void of a missing child and my children’s hurt of a lost sibling is still rawbut it doesn’t change the mommy tired, the spiritually tired, and mental. Stress is very high. I have two kids that are not in interested in helping prepare beforehand. So when it comes time to leave, chaos in sews. Help!!!! Stress level usually runs high. I have two teenage daughters…need I say more?? My husband says we need counseling. My reply is that they just need to do what I say. I’m a survivor of a closed head-injury (12/24/89). I don’t think I’m different but they feel otherwise. Any relational help I can get is greatly appreciated. my stress level varies day to day. I am a step mom to 4 beautiful children ranging In age from 15 down to 3 year old twins, and 2 of my own that are grown. Some days are good some not so good. I try so hard to keep my cool and find that happy medium. Sometimes I’m successful but lately it has been harder. I would love this book whether free or otherwise. Thank u for thinking about the struggles of other moms real or step and I know God will bless u for it. The stress level in our house is in the middle to high range. We have 3 amazing children (3, 1.5, and 6 months) My husband is military and we try to make the most of our time when we get it but lately we take turns with kids and chores and bills and it is hard to be happy paying bills and cleaning the house. I have two teenagers so it depends on the day lol. It is most often high. Ahh i feel this was in my newsfeed for a reason… Mom of 2 boys ages 4 and 5.. About to start kindergarten.. The last 3 weeks have been super challenging.. Stresss level: super high.. I would say medium stress level. Stress level is high here! Just moved 500 miles, staying in a 2 bedroom apt as we wait for a short sale house, New job, new school and daycare for the kIds, husband is away a lot for his job, commuting for military 500 miles away one weekend a month until we can hopefully transfer closer. It is hard sometimes to keep focused and to be a calm presence for my kids. But I try my darnest! The last two weeks it’s been at an all time HIGH!! Makes me so sad as I want to be enjoying these last few weeks of summer with my munchkins. You have enough left to do dishes? Ugh. I have enough left to sit and do nothing. Hi! I’m a single mom of 2 crazy boys ages 9&7.. I’m very interested in this book, as a matter of fact just today my oldest told me “mom why don’t you ever look happy?” Ugh! It killed me inside. I let my stresses get the best of me instead of enjoying my kids. I need some me time. I love my babies, but Mommy needs a little break. very high! Homeschooling 3 kids, multiple extracurricular activities, and my husband is never home to help. I feel like a single mom juggling everything except the finances. I know I fail as a mom sometimes because my attitude slips and I stay weary and stressed. I don’t want that to be taken out on the people I love most. Thank you for your words above. Regardless of my attitude I will still have the same activities ahead of me. I know I am thankful for my precious angel -3yr old daughter, but I am also Mama to my 20+ “students” / my kids. I often use up so much of myself at school there isn’t enough left at the end of the days at bedtime especially. Any help would be appreciated. Feeling very stressed going into this fall season. I have 2 kids, age 3 and 11. My 11year old has such a busy schedule and this year my 3 year old is joking dance as well. On top of that, I am in process of becoming a surrogate for a friend and we find out the results next week! Would love to start this book in this season! This couldn’t come at a better time…battles with my MS and being an active soccer mom and wife has gotten a but overwhelming to say the least. I really just had a little break down yesterday night. Not feeling well intensified my not happy stress! I want to be happy mom again… My oldest is in college so what you said is true they will be gone before you know it and I want them always have a good relationship. My 16 and 10 know when I don’t feel well so they pick up the slack but they are very busy after school and if I work that day stress is just there! I would love to read your book!! Hopefully you will enter me into the drawing beacuse this mom is very stressed to say the least! Most days my stress level is medium…BUT can change in no time flat unfortunately. I’m a wife, homeschooling mom, and have two boys one of whom has special needs. I need help with being a “happy” mom. I definitely have inner joy, through my Saviour, that doesn’t not fade, but I want my kids to experience “happy mom”. I would love to own this book! HIGH. I needed to be reminded I’ll be doing the same tasks, I choose my attitude. This week has been a medium leaning towards a high stress level for me. It’s only Wednesday and Tuesday already felt like it should have been Thursday already. Four children plus one niece ages 2-7 have been driving me nuts! My stress level I would say is high. Navy wife. Mom of 3 kids 7 and under. Homeschooler. I am not the happy mom I thought I’d be. So stressed all the time, especially when my husband is gone…like now! Stress in my home is extremely high these days. I have 5 children (12, 10, 8, 5 & 2) with another due in December. My husband owns his own business and is working out of town for the next 6-8 weeks. Help is hard to come by and the 5 year old is desperately seeking out attention in very negative ways….. I feel like I’m losing my sanity almost every day!! High stress here! Would love a new plan of action for changing our home life! Medium. I have a twoand one year old, I stay at home and babysit for s noyes parent. Some days get stressful because I am trying help my hubby with grading papers keeping upa w chores and taking care of little ones. Some daysare easy others not so. Depending on how the kids are. I enjoy it but sometimes I just feel stressed. Not much alone time. This past year has been just nuts! I have a 8 year old and a 9 month old. I also have a husband who is fighting cancer. He has almost finished with the chemotherapy and radiation. But we’re all dealing with this. So my stress level is through the roof! Enough said…. Not looking forward to that. So most days, I go through my tasks as if they are a burden? When in actuality, I want them to remain. But attitude is everything and if mine is bad, it’s not fair. Oh this sounds like such a good book. The statement that I can do the same account activities with joy hits home. I just got through yelling at my 12 year old son to finish an assignment when I stumbled across this. I have three children, 12, almost 10, and 7. Their father, my husband, passed away back in 2012. I’m since remarried and struggling with anger issues. I love my kids so much. I know how fragile life can be yet I can’t get out of this cycle! Stress level, through the roof! Stress level is high! I don’t like it at all and i feel so bad for my children. It is not how i want to be. Thanks. I am mid-high level of a stressed out momma. I have 2 daughters; 13 and 10. Most days it seems I can’t do anything right. I feel like I am loosing my girls. With school beginning I am afraid it will get worse. I know my stress/ anxiety makes it worse. I hear myself say things that I shouldn’t. I want to be a better mom. I am a mother of four, a 6 1/2 year old boy, 5 year old boy, 3 1/2 year old girl, and an almost 2 year old boy. I love my kids, they are sweet and funny and kind, but my stress level has been through the roof lately. We found the perfect house for us last month, really, my dream home! We weren’t planning on moving for another few years, but God has been amazing in providing us a way to buy it. What it boils down to is that I am overwhelmed with anxiety waiting. Th closing date is a little over 2 weeks away, and I am stressed out by how much needs to happen, all of the waiting, waiting on an offer on our current home…my brother and his wife are having a baby any day now, and they are going to try a vbac after 2 c-sections, and I feel anxious for them as well. I feel frustrated, because there is nothing I can do but to wait. I should be happy, but I just feel anxious. I have been short with my kids, and generally grumpy, and I just want to be happy! My 2 yr. old is just a little tornado, so while I try to keep our house as clean as possible for showings, he is constantly into something. And by being distracted and grumpy, it’s playing off on my kids, and let me just say, that is NOT cool! I know that my anxiety will lessen once we move but just the move itself is going to be so much work! Oh, and people are NOT joking when they say that having more than one boy can be really terrifying for a mom! Talk about adding to the stress, boys running in the roads, climbing everything and everything, eating who-knows-what! Wow! It’s comforting to know that I am not alone! Having a teen an 8 year old is overwhelming. I am not sure who has more attitude, me or them. I recently just stopped and realized that I am too stressed out! Totally not being the mom that I want to be. High stress. I have a senior and freshman in high school this year (both 3-sport athletes), my husband and I are on the Booster club board, I’m also on the Education Foundation board, we own our own business with 8 employees, I’m starting another business (you know, in my free time ?) and trying desperately to all stay involved in church and each other! It’s exhausting! The past 2 years has been rough for my marriage, and as a result, my kids have received the brunt of the anger, resentment, hurt, and stress of it all. I chose to be a stay at home mom so my kids could always have a parent in their life, especially because my husband works full time and goes to school part time. I don’t find it fair to them when I find myself snapping at them, yelling at them, or just making them feel less about themselves. I want my kids to see and receive the BEST of me because that’s what they deserve!